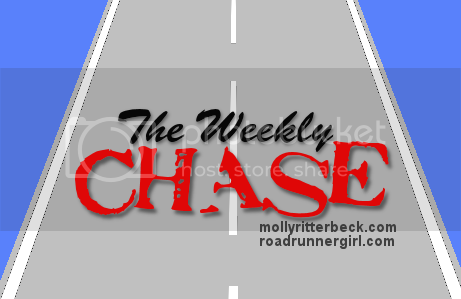 Road Runner Girl: The Weekly Chase #157! Oh my goodness y'all! I had an amazing weekend!!! It was super busy but oh so fun! It started Friday after school when Jenny came and picked me up and we headed to meet Katie (seriously go follow her...she's awesome) for lunch! Katie is one of our roomies for Princess weekend....but we hadn't met her in person. So we decided to meet for lunch! We ate at Jason's Deli...yum! And then we talked for hours! She is precious! Meeting her made me even more excited for Princess weekend! We are going to have a blast!!! The rest of the night involved picking Sawyer up from gymnastics and taking him to the church for Parent's Night Out. Andy and Hayden were camping with the boys scouts all weekend so it was just me and Sawyer. While Sawyer played at church I went to dinner with Kirstin and her family. Then we went back to her house and played Mexican Train Dominoes until it was time to pick up the kids. What a fun night! I also discovered on Friday that I had made a mistake in my run streak day count. Yep. On August 22nd I was supposed to be on day 455 and instead I logged it as day 445! So I've been 10 days off since August! At least it was in my favor. But of course I had to go back through all my runs and log them as the correct count in Garmin connect! I'm all correct again! But what a mess!!! The next morning was an early wake up call for me. I got a 2.5 mile run in and then it was time for my ladies basic handgun class! My Dad is a retired Deputy Sheriff. He took me shooting when I was a kid but that's probably been about 25 years ago! I remember being pretty scared of it back then. And I've never touched a gun since. So when a friend asked me if I wanted to attend this class with her I decided yes. Yes because I knew Andy would love for me to take it and yes because I knew it would make my Dad super happy. I was super nervous that morning. But I had no reason to be. Y'all this class was AMAZING!!! The class started at 8:30. We spent from start time until 12:45 in the classroom learning all about guns, safety, cleaning guns, handling the gun we were going to shoot that day, and the laws of carrying a gun. We broke for lunch and then headed to the shooting range to practice what we had learned. The cool thing was that we were using the city's police training shooting range. So we were the only ones out there! The instructors were amazing! When it was time to shoot they had us load only one bullet in our gun and take only one shot. They said once we got that one shot in we would feel better. And then they would let us shoot as much as we wanted. Y'all...I WAS SO NERVOUS! I was shaking so bad! But I took my shot...and it was a bullseye! I couldn't believe it! After the shot my heart was beating so fast! I thought it was going to pound out of my chest!!!! But it eventually slowed down and I got more and more comfortable the more I shot. I got to shoot my husband's .22 Long Rifle and a 9mm that was the instructor's gun. He wanted me to try it. The guns were different but I loved shooting them both! We started out with the targets you see in the pictures. We shot those for awhile and then they put up new targets. Look how good I did y'all!!!!! I had the best target in class! One of the instructors asked who shot #9. I raised my hand and he said, "Yes Mam!" It was so funny! I couldn't believe I did so well! After that the class was over but they said if any of us wanted to stay and shoot some more that we could. Me and the friends I rode with all wanted to stay. So they put up different targets again. This target had different numbers and letters on it. The instructor made us start in the ready position. Then he would call out a target and we had to fire one shot at it. There were also a few times that he had us shoot the target twice back to back. It was so much fun! And again...I hit the target every single time! I was pretty proud!!! So I think I love shooting now! And I feel way more comfortable around a gun now that I have knowledge about them and have practiced. I don't want to lose the skill though. I hope to keep practicing. On the way home I texted this picture to my hubby. I LOVE his response!!! And of course I sent it to my Dad! He was so proud of me! He called me later that night and I could hear the joy in his voice! I told him he had to take me shooting again soon! Sunday I woke up early again (but not AS early) to get in a long run. I ran 6.2 miles! I'll tell you more about my run on Wednesday. The rest of the day was spent with Hayden and Andy. We missed them so much this weekend! We were busy washing clothes and all the camping stuff, cleaning and putting the tent away, and cleaning the gun I used yesterday. Busy afternoon but fun times with my family! That afternoon I headed to the track for week 2 of couch to 5K with the Sole2Soul Sisters! All of the ladies are doing amazing! In addition to Jenny's daughter Lily coming last week...this week Kirstin's daughter Maddy came! Lily and Maddy are doing so great! I'm so proud of them!!! Goal #1: Run every day! Yes! I got my streak in every day...even with having to wake up early and run in the dark again! Goal #4: Move 11,000 steps or more each day this week. Yes! A couple of days I walked around the living room to get in the steps but I made the 11,000! Goal #5: Run at least 1 run under 2 miles. Yes! All my runs during the week this week were under 2 miles. I think my legs needed that since I did so much running over Christmas break! Goal #6: Get back into the routine. Yes. It was a tiring week trying to get back into the swing of things. But we made it through! Goal #7: Get things ready for my ladies basic handgun class. Yes! I had everything ready to go come class time! Goal #6: Shop for a Mardi Gras ball dress. Andy and I got invited by our friend Kirstin and Jim to attend the military Mardi Gras ball. I'm so excited!!! Of all the years we've lived here we haven't gone to a ball! The ball is January 29th so I've got to find a dress soon!!! Goal #7: Book a hotel for Sawyer's next gymnastics meet. Sawyer has another meet in two weeks! I need to get our room booked! So that's the plan for this week! And then next weekend we have a 3 day weekend! Yay!!! I hope you all have a wonderful week!